Smart Assign is a feature you can use to automatically assign a conversation to another staff member without having to pick any specific person. This will assign conversations in a “round robin” manner. Re:amaze will take the conversation(s) and distribute them to the staff member that has the fewest number of unresolved conversations open. 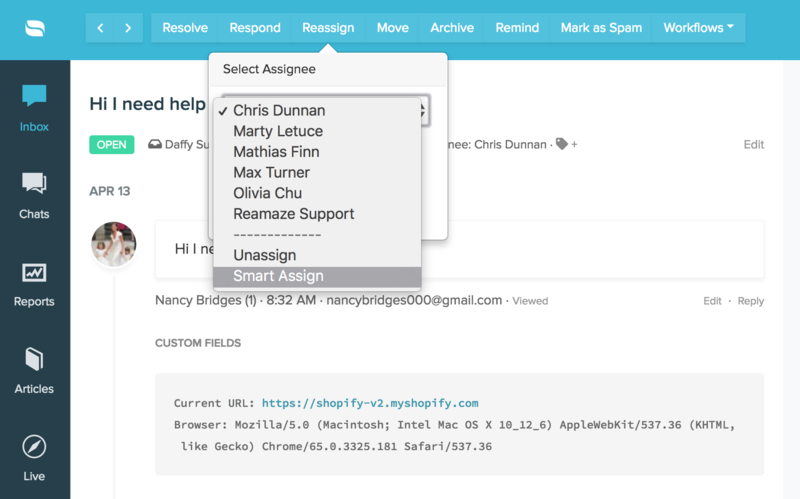 Smart Assign will not target inactive staff members (defined as staff that have not responded to a customer within the last week), so it's safe to use if you have staff users who are only use the system as participants or bystanders. Smart Assign is also available as an automated workflow command so you can completely automate the assignment of conversations for a particular channel or even a subset of conversations within a channel. For example, if you’d like to have Re:amaze automatically assign conversations to staff members for the support@acmecompany.com email channel, simply set the trigger to whatever you prefer (perhaps the incoming channel) and then set the command to smart assign the conversation!